Mark Hamill is known for his quick wit on social media and often gives advice to his followers who ask. But, the actor revealed that he doesn't always have all of the right answers while relaying some terrible advice that he gave to Arnold Schwarzenegger back in the day. It's impossible to be right all of the time, which Hamill recently revealed in his social media post. It's refreshing to see an actor take aim at themselves for something that they did decades ago. When a Star Wars fans pitched the idea of a "What would Mark Hamill say?" t-shirt, Mark Hamill wanted to get something off of his chest about having an answer for everything. While he often does have an answer for everything, they're not always the right answers. Hamill points this out with the aforementioned advice that he gave to a young Arnold Schwarzenegger. He had this to say. "Arnold Schwarzenegger asked me for advice when he was just starting out. I told him to lose his accent for a wider range of roles & to change his last name since no one could pronounce it. He did the opposite & became one of the biggest stars ever." Arnold Schwarzenegger is one of the biggest actors in the world and he is widely known for his accent, which Mark Hamill told him to ditch. In Hamill's defense, a lot of people probably told Schwarzenegger to do the same thing back in the day before he was a household name. However, Schwarzenegger had the last laugh and is currently filming Terminator 6 with his thick Austrian accent prominently on display. If that wasn't enough, the actor also served as governor of California for two terms. 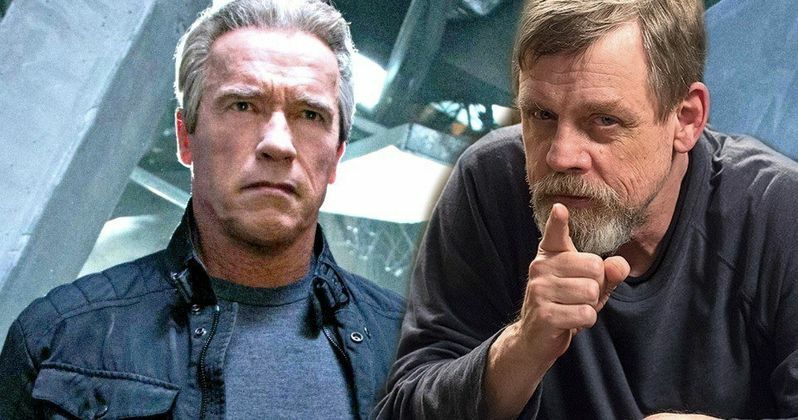 Mark Hamill and Arnold Schwarzenegger have a lot in common. They're both huge stars from giant franchises and they also love to troll President Donald Trump. Hamill recently poked fun at Trump's Space Force, joking that it's not a real title for Star Wars 9, and claiming that it's just another lie that the president tells. Though Schwarzenegger hasn't said anything about Space Force specifically, one can imagine that he's not a fan either. The Terminator actor and former California governor often takes aim at Trump in pretty humorous ways, calling him a "fake conservative." Mark Hamill doesn't always have the Force on his side, but at least he can admit when he's wrong. Arnold Schwarzenegger, thankfully, didn't take Hamill's advice all of those years ago and made a huge career utilizing his thick accent and hard to spell last name. Hopefully, Hamill will go on to reveal other advice blunders that he has given over the years, especially if they're as funny as the Schwarzenegger story. You can read about the time that Luke Skywalker gave the T-800 advice below, thanks to Mark Hamill's Twitter account.